Structure Unit available in standard DIN size (1/4 DIN) IP-54 protective construction. Programming Features Unit features large program storage capacity of 100 segments in 10 patterns. Programmable Alarms Units features as standard 3 Alarm outputs with optional 1 Alarm. True Multi-Input Unit features true multi-input capabilities:10 thermocouple types, 2 RTD type, 2 current inputs, and 1 voltage input. 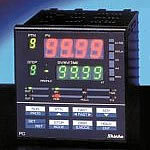 Control Action Unit features as standard full function third generation PID Autotune or ON/OFF servo output PID. Heat/Cool Control Action (option) There are 3 types of control output: Relay control output (DR), Non-Contact Voltage output (DS), DC Current output (DA). Approvals UL, cUL and CE Safety Approvals.